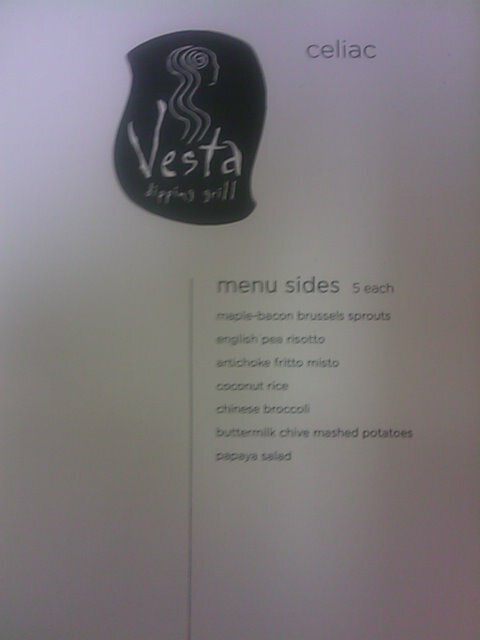 Vesta Dipping Grill in Denver, CO Drives Home a Hit! This past weekend I visited a dear friend of mine in Denver Colorado. She is one of the happiest people I know and she loves being active outdoors. She is so cute, she ads “lou” at the end of things like Huggy-Lou, Kristy-Lou, Drinky-Lou. It is her signature language. Every time I come to visit, she does the best job planning activities. This time was no different, she planned a fun night of drinks and dinner and even did some research on where I could eat gluten-free. A few days before my trip Kristy sent me a link to the restaurant she had chosen, Vesta Dipping Grill. I immediately went to their website as well as did a search in google for Vesta Gluten free to see how friendly the web world thought Vesta Was for those of us with Celiac. I immediately found it on Urban Spoon rated in the top ten restaurants in Denver for gluten-free dining. I immediately went to their website and told them I was coming to eat there with some girl friends and wanted to see what kind of arrangements I needed to make there to let them know I would need a special menu. While I never checked my email before dining, after we sat down we were approached by their manager Jeff Bustos who asked if Jennifer was at the table and he referenced my email to him. He let us know, that I was looking at a Gluten Free menu, when in fact they have an actual Celiac menu. I have never seen this before and could not have been happier. There is a growing trend across the nation for those without Celiac disease to eat gluten-free. There are many benefits to dining gluten-free regardless of if you have Celiac or not, however extra precautions need to be taken in the food preparation process for those with Celiac. The difference between the two menus is that the Celiac Menu took into account cross contamination while the Gluten Free menu only took into account ingredients in the meal that contain gluten. For example, I asked about the tater tots and was quickly informed that while the ingredients were gluten-free, they were fried in the same batter as gluten containing food items. So this would be ok for someone trying to eat gluten-free without the sensitivity, but for me who cannot have ANY it is not ok.
Vesta Dipping Grill also has gluten-free beer on their drink menu. 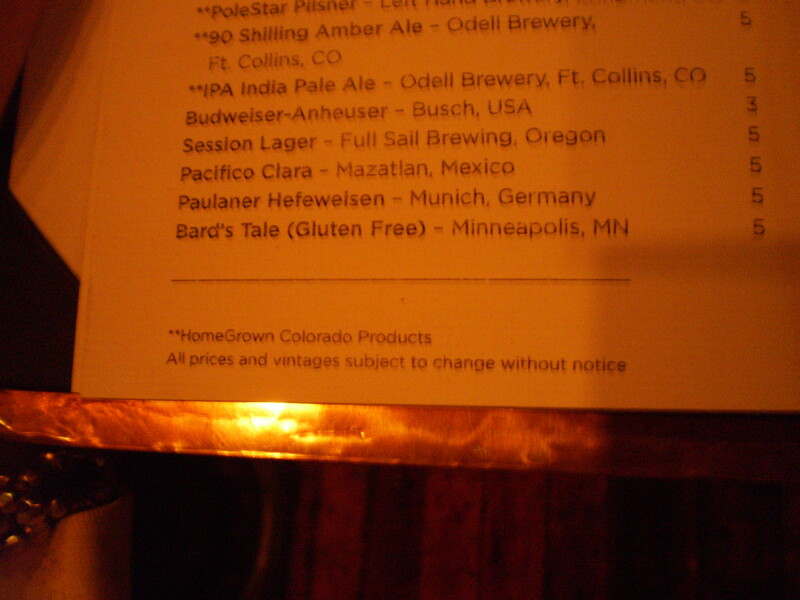 I have never seen gluten-free beer on a menu at a restaurant before. It was delicious! 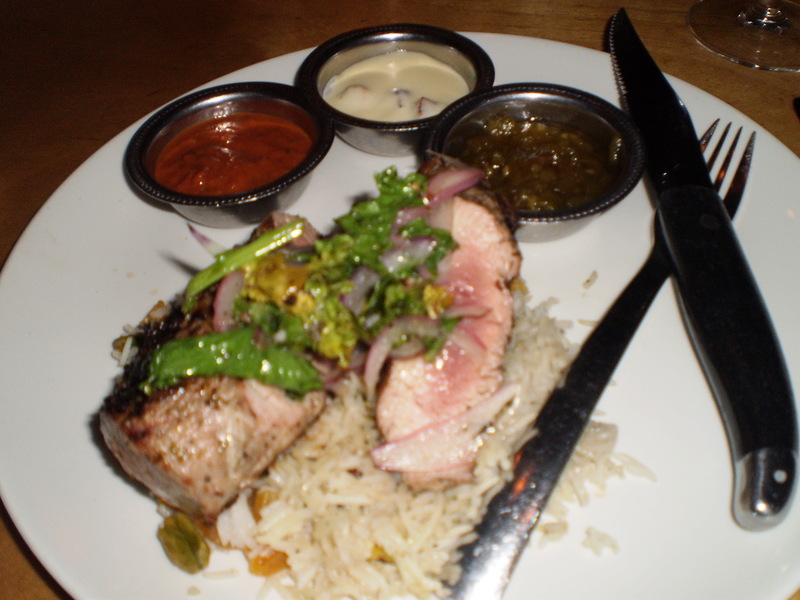 For dinner I ordered the Jalapeno Grilled Pork Tenderloin with coconut rice and mustard greens. 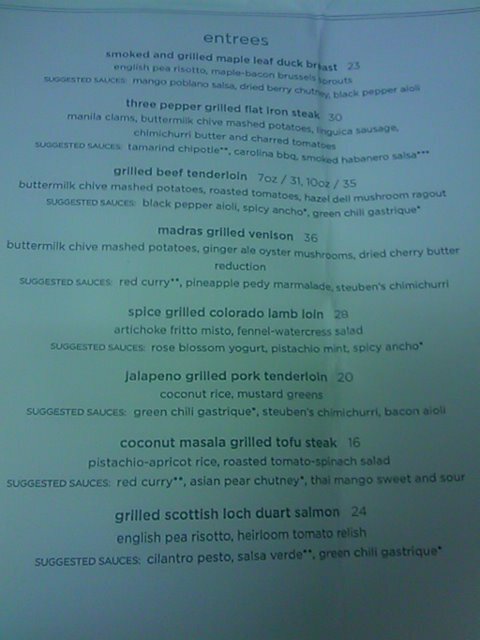 I got it with their recommended sauces which were green chili gastrique, Steuben’s chimichurri and bacon aioli. It was AWESOME! I did not like the green chili sauce too much but the other two were amazing. I have always been a sauce girl. I love dipping things like chips and salsa, veges and hummus and this night, pork tenderloin and bacon aioli. It was so fun to dip, however, my meal could easily stand alone, the flavors and seasoning were just right. My friend barely even dipped because she wanted to savor the flavor of her beef tenderloin. I enjoyed the flavor of mine, but the variety of sauces was to die for. The portion sizes were reasonable and the presentation was not pretentious, it was appropriate for the atmosphere. As a southern girl, it was great to see a restaurant out west do greens right. All in all a great experience, great ambiance and super service.